Turner Field has always been a place of wonder for Atlantans - a pantheon of summer magic, autumn heartbreak, winter restlessness, and spring hope. But with the Atlanta Braves moving to the newly-constructed SunTrust Park in Cobb County next season, Turner Field is being retired and marked for demolition. If the stadium was a person, it wouldn’t even be old enough to buy itself a beer, yet the Braves have spurned its awe and magic for the manufactured corporate atmosphere of a new stadium in the suburbs. This begs the question: why did the Braves want to move in the first place? Why abandon Turner Field in its prime? To answer that question, we have to turn back the clock to the 1990s and take a look at how the Braves got Turner Field in the first place. From 1966 to 1996, the Atlanta Braves shared Atlanta-Fulton County Stadium (formerly, just Atlanta Stadium) with the NFL’s Atlanta Falcons. AFCS was built in the predominant stadium style of the 1960s - multi-purpose, concrete, and fielded with Astroturf. Within its Stalin-esque confines, Hank Aaron hit his 715th home run to break Babe Ruth’s record; Dale Murphy became a star; Bobby Cox became a legend; John Smoltz, Greg Maddux, and Chipper Jones became All-Stars and fan favorites; and the Braves established their dominance over the National League during the early part of the 1990s. As they cemented themselves on the field as one of the best teams in the MLB, the Braves looked to improve their field itself, searching for avenues to either improve or replace Atlanta-Fulton County Stadium. With the Falcons’ Georgia Dome completed in 1992, the Braves were now the sole tenants of AFCS - a 30-year-old testament to 60s architecture and baseball history, but a dilapidated shell of itself in its prime. After months of stalled negotiations with the city, the Braves found a friendly ear in the Atlanta Committee for the Olympic Games (ACOG), which agreed to turn over control of the future Olympic Stadium to the Braves after the conclusion of the Olympic and Paralympic Games in August 1996. On March 29, 1997, the Braves debuted their new stadium versus their opponents from the previous season’s World Series, the New York Yankees. Later that same year, Atlanta-Fulton County Stadium was demolished to make way for more parking for Turner Field attendees. All that remains of AFCS today are the outline of the field, the outfield fence over which Hank Aaron’s 715th record-breaking home run sailed, and the concrete wall of the stadium - all kept as mementos of Braves history and a time long past. More can be found at Bleacher Report (warning: slideshow). Today, the Braves stand in stark contrast to the powerhouse teams of the 1990s. Newer management and lackluster seasons have forced the front office to focus more on player development at the minor league level to rebuild and grow the team for the future. Since 2013, the Braves have not been that great of a baseball team to watch. But still, as a result of the modern stadiums ‘arms race’ and to improve fan experience, the Braves organization desired a new facility (or at the very least, money for renovations) and asked the Atlanta city council to fund the project with public money. The Braves argued that since Turner Field was an Olympic stadium retrofitted for baseball, its engineering was best suited towards multipurpose use and therefore extensive repairs and upkeep would be necessary to keep the stadium in the utmost condition. They also pointed out that since public transit was almost a full mile from the stadium, fans were less willing to attend games because of how hard it was to get to the stadium. Above all, the organization emphasized that the area surrounding Turner Field was not representative of its fan base and had no commercial development to keep fans in the area before and after the game like other stadiums had. The city flatly declined the team’s proposal. After shelling out taxpayer money to help fund the Falcons’ new stadium, the city simply could not afford to divert funds to the Braves’ project. Mayor Kasim Reed refused to let the Braves extort the city and called the team’s bluff when they threatened to move elsewhere in the area. Unbeknownst to him and the city at large, Cobb County agreed to put up $450 million of public funds for the Braves to build a new stadium at the intersection of I-75 and I-285 near Vinings. 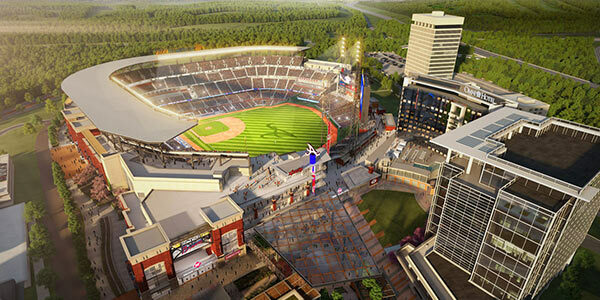 And so off the Braves went to Cobb County, ready to build a new ballpark and mixed-use commercial area around it. The Braves are moving to Cobb, and nothing’s going to stop them - that much is certain. It’s just sad to see a stadium so young, so full of life, and with so much excitement ahead of it being shut down and scuttled in favor of suburbia. In every home game of its final season, we should aim to soak in and enjoy the magic and wonder that the Ted has brought us over the years. Turner Field is where I went to my first baseball game – where I was first introduced to America’s most historic and hallowed pastime. Regardless of what happens to the site in the future, it will forever remain a symbol of Atlanta as a city and its sports heritage - a constant reminder that the people of this city can be united: in love of city and in love of sport.